It has got everything. ac wifi and bluetooth 4.0. A88 chipset. USB 3.0 headers and on-board. 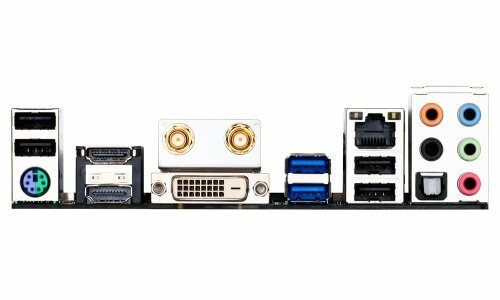 4 SATA3 ports. The only annoyance is its live USB ports that are supposed to provide charging while its off. Can't figure out how to turn it off. There is a driver and utility to turn it off but I haven't had enough time to research it. I would highly recommend this board. I've had a few random blackout shutdowns even though my wattage should be well below 450, using different power supplies. I suspect the mobo. I don't think this mobo can run voltage controlled fans, so the front fan in the thermaltake v1 (200mm 3 pin) is running full speed (800 rpm) all the time. :( Total bummer, this this could be pretty silent. This mobo only has 1 sys fan out and 1 cpu fan out, so running additional case fans right off the mobo isn't going to happen. I bought this mobo instead of the a88x Asrock because the Asrock's fm2 socket is pointing 90 degrees from normal, and I wanted the CPU cooler to point to the back of the case to carry airflow through the case. However the Arctic CPU cooler I bought, mounted on this mobo, points 90 degrees from what I expected, hence it points the heat right at the GPU. Also it should be noted that this mobo has the CPU situated very close to the GPU/PCI slot, which limits you to ~92mm fan CPU coolers (about 120mm total width possible). Nice form factor. Really compact thank to the ITX. The wifi seem to be fine since I used to have connection problem with any small D-link wireless card. Fast look at the BIOS and everything look good. Small, compact, tight... call it what you want but it fit my case. Total lack of Linux support annoying. Lost a star for that. Once I chose Mini ITX and AMD my options were few, but this board has worked fine. Not my favorite motherboard but awesome set of built in goodies. Better than most on the wireless card card placement, connections, reliability. Had trouble with CPU cooler header and some odd issues with USB not working--I'm not sure that wasn't a USB3 extensible driver issue so I'm not knocking off a star for it. Would probably not buy again, opting for ASRock or Asus. Probably the best Mini-ITX option available for the FM2+ socket, thanks in-part to the inclusion of onboard AC Wifi and Bluetooth 4.0 as well as the solid black color theme. Plenty of back IO ports to keep you satisfied, and a good range of internal ports. Wish it had a few more fan headers SATA ports, as 4 is a bit limiting (1 SSD, 1 Optical Drive, 2 HDDs) but as it IS a Micro-ITX board sacrifices must be made. Its BIOS isn't as pretty as something from, say, Asus but it is very much easy to navigate and very useful. Power delivery and build quality are outstanding, as is the custom from Gigabyte. 3.8/5 because I want 6 SATA ports :P and because only having 1 chassis fan is inexcusable for a $120+ motherboard (1 header for CPU and 1 for chassis fan). I question Gigabyte’s decision to put the CPU socket in such an odd spot. To me it seems like they wanted to make it harder to install an aftermarket CPU cooler with a backplate, because plenty of cases have a hole to put it in, like the Core V1, but I had to strip the entire system to install the H55. I hope I never have to do that again. It did an ok job of overclocking the 7700K to 4.1GHz for about 2 days, then the system froze so I turned it down to 4GHz (most likely because of the PSU). I was testing the overclock for two weeks, and have since turned it off until I need to again. I like the Bluetooth, although Win10 does some strange things with it, so I can’t really have a stable connection between my Android phone and PC for transferring files to and from. 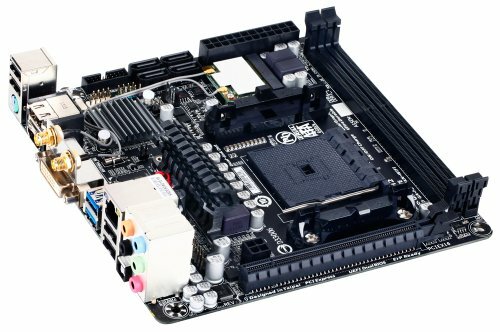 everything is placed neatly, Comes with all the standards you need Lan, Wifi, Bluetooth ,the board is very solid to hold and it fits the i/o panel comfortably unlike my last mobo. BEST FEATURES FOR THE MONEY. 7.1 support, RAID support, S/PDIF out, Bluetooth 4.0, A/C WIFI, USB 3..0, all at a conservative price. It's up there with the best of 'em. Any feature not found on this board would justifiably be incorporated at a higher price point model. Just a reminder, no on-board video unless using a graphics integrated APU, so post from your graphics card if using an Athalon X4. Also motherboard supplies a nice simple UI for overclocking, simple boot management. Also supplies 1 DVI-D, 2 HDMIs.